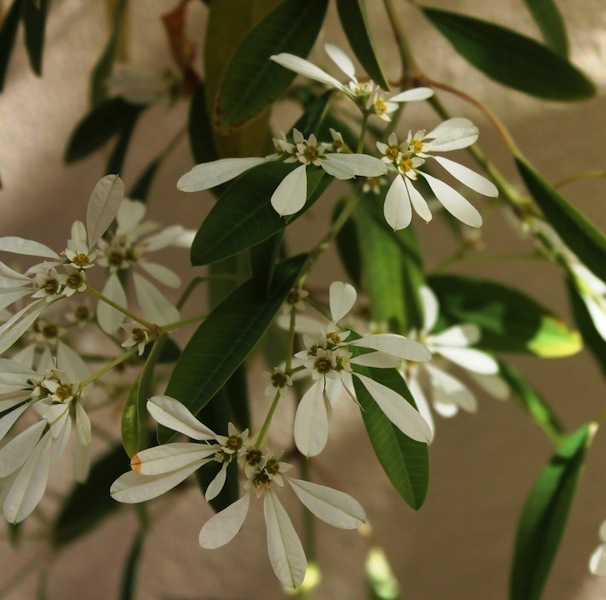 When I first smelt the aroma of toasted coconut in the laneway next to my house I couldn’t work out where it was coming from but using a process of elimination I realised that it must be coming from the Snowflake bush, Euphorbia leucocephala. It’s one of those fragrances that you can’t really smell when you sniff the flower but it tantalisingly floats in the air nearby. Euphorbias are generally known for their showy “flowers” or unusual foliage rather than the scent they produce, so I was pleasantly surprised to find that the tropical fragrance was indeed coming from the Euphorbia. The Snowflake bush (not to be confused with the Snowflake bulb) is so much more delicate and refined than its close relative the Poinsettia, Euphorbia pulcherrima. They are similar in that the true flowers are small and insignificant and it is the bracts surrounding the flowers that look so eye catching. As indicated by the common name, the bracts of the Snowflake are white to cream and they are arranged around one flower or groups of 3 or 5 flowers. The bracts are of unequal length and are clustered on one side of the flower which creates a beautiful, lacy effect and gives rise to another of its many common names – White laced Euphorbia. 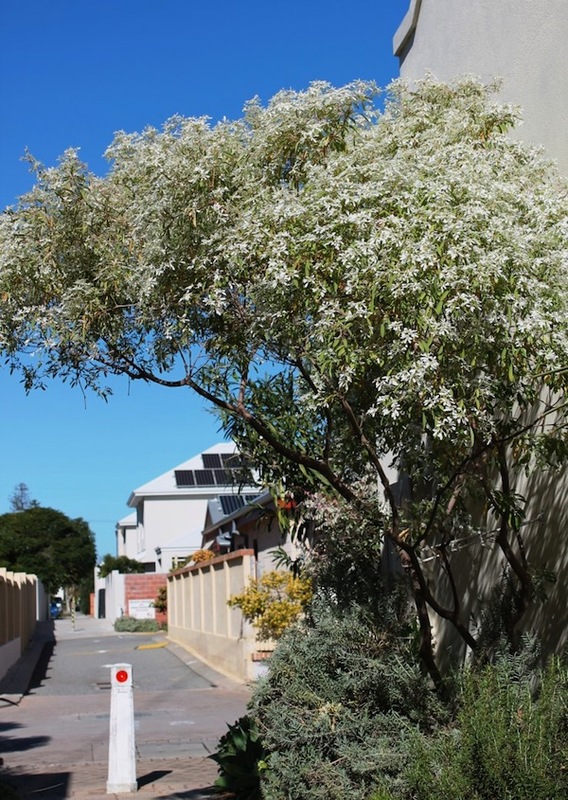 Passers-by often comment on how beautiful the Snowflake bush is when it is smothered with blossom which persists for at least 2 months during autumn and into winter. My plant is pruned so that cyclists can ride past without damaging the plant (or themselves) so it is nearly 3m tall. It is another of those plants that I didn’t have room for in the garden so I plonked it in the laneway to fend for itself. It’s wedged between bulky house footings and the footpath in unimproved soil. Actually calling it unimproved soil is being complimentary – in fact it is a mixture of sand, rubble and old road base but I wanted to maintain the character of a laneway which is created by the really tough plants that survive in the adverse conditions of laneways. I did end up making some concessions though, so the Snowflake is sparingly watered twice per week in summer. Being on the leeward side of the house it doesn’t receive much rain in winter, although the roots have probably travelled far enough to get the moisture they need. As it is planted against the east facing wall it receives plenty of warmth but is protected from the hot, drying afternoon sun in summer. It took a number of years for the Snowflake to flower prolifically and this was probably due to two things – the first one being that, like their cousins the Poinsettias, the Snowflake flowering is triggered by the reduced number of hours of light that the plant receives. This one is planted directly opposite a street light but fortunately over the years a very dense street tree grew up, completely blocking out the light so the bush is now in darkness for about 12hrs per day from mid-autumn until early spring. The second factor that helped with the flowering was that 3 or 4 years ago I started drenching it with diluted worm juice a couple of times a year. Prior to that it only received an annual dressing of slow release fertiliser. (I did say I made a few concessions). 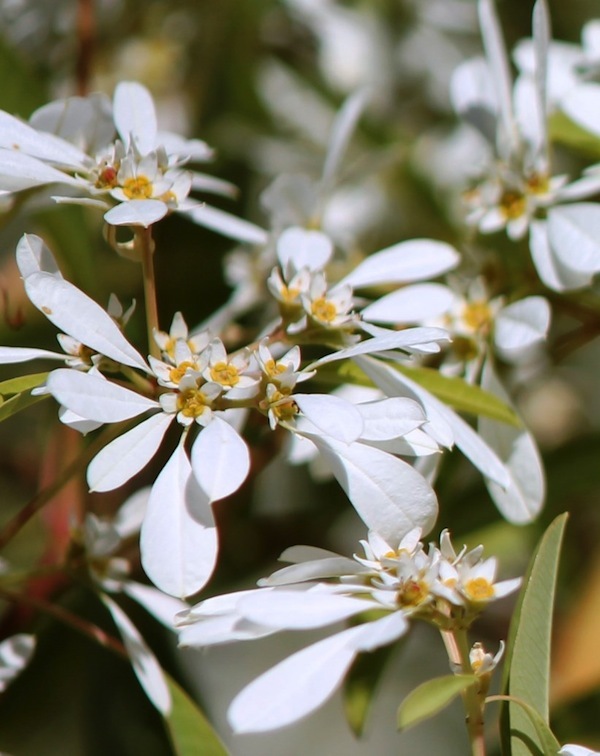 Euphorbia leucocephala is a native of tropical Central America so it won’t tolerate frosts and is therefore best grown in coastal areas in the Perth region. My specimen is fully deciduous for a short period and that’s when I give it a light prune to shape it. Images I’ve seen of Snowflakes growing in tropical gardens indicate that they are normally a maximum of 2 m tall and are usually wider than they are tall but obviously that isn’t practical in the laneway. The milky sap is reported to be a skin irritant but as I prune when the plant is dormant there is very little sap to be seen. None of the many pests (3 or 4 species snails, slugs, caterpillars and weevils) that frequent the laneway has an appetite for the Snowflake bush and I suspect that is due to the irritating sap. Despite its delicate looks the Snowflake Bush has proved that it is a survivor in tough conditions with minimal maintenance but any additional care is well rewarded with a more spectacular display. I love the snowflake bush too, Linda, but have never noticed the smell of toasted coconut you mention. Interested also to learn they are related to the poinsettia and the flowering depends on the amount of light it receives. 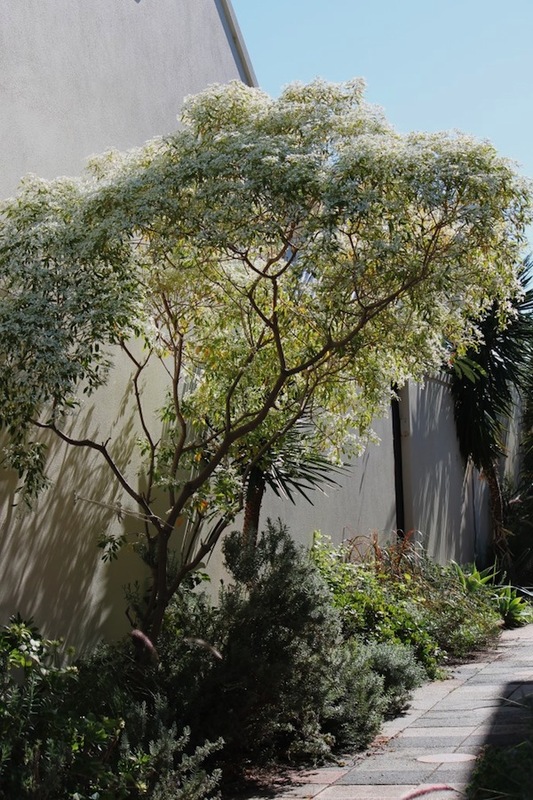 Mine is at front of house on northern side in a large pot – somewhat shaded by overhang of courtyard peppertree and it flowers for some weeks on end. It’s one of those plants that just shimmers with the breeze and drapes delicately as it grows. Yes they are gorgeous Julie. This is the first year that I have smelt the scent and I’m wondering if the weather conditions somehow affected the smell. We had a long run of clear, sunny but cold days with no wind early in the season when the true flowers were still fresh. It would be interesting to hear if anyone else has noticed the aroma. The flower industry cleverly manipulates the number of hours of darkness that potted poinsettias receive so that they come into flower at Christmas time. Yes, I’m going out right now to smell my snowflake tree:) never noticed it before reading the above. 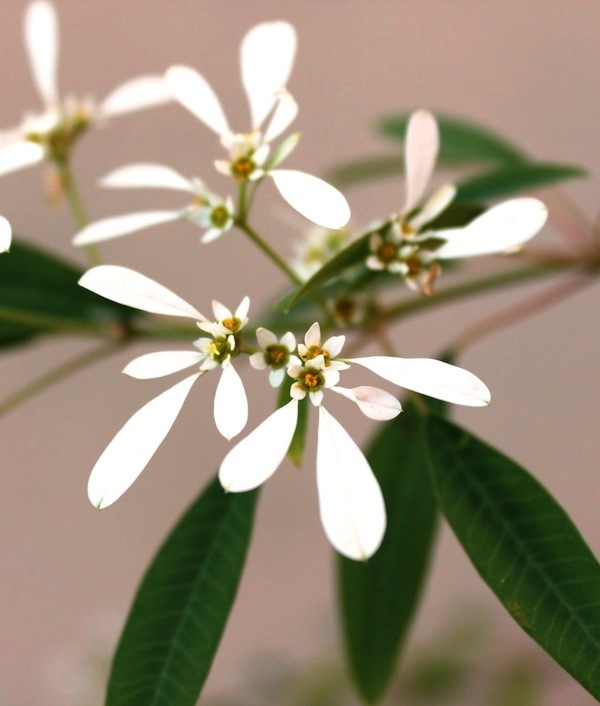 We love our euphorbia, we call it the fairy tree because it looks so ethereal and lacy when in flower. Had it here in Kalgoorlie in WA for about 14 years now and it never ceases to give us joy. It is interesting to hear that your snowflake is doing well in Kalgoorlie, Louise. It proves that it is a hardy plant to deal with the extremes of temperature experienced in Kal. Two years later and I am a tad worried about my euphorbia tree ,it was in beautiful bloom when we came home from the East in June but now has lost leaves and looks totally unloved amd bare. Can’t recall when it has been completely without leaves, just worried as we have had a bitter winter here with about five frosty mornings. Will it be okay? And foliage will soon come back? Might give it a feed of seasol around the drip line maybe? Hi Louise, in theory the cold weather could kill your Euphorbia but I think there is a good chance that as soon as the weather warms up new leaves will appear. I wouldn’t do anything until then. Some of the smaller branches will be dead so prune back to just above the new leaves. You can then apply seasol and/or fertiliser. Good luck. I have 4 beautiful snowflake trees and 1 of their leaves is drooping and looks very unwell. Not sure why. Could it be a disease. Can anyone help me out. Without knowing where you live or the individual circumstances of your trees it is very hard to determine the cause however there are a few things you could investigate. The first thing to check is lack of water – has a sprinkler blocked, an irrigation pipe broken or has the soil become water repellent? If water is the problem the leaves should perk up when the plant is given a good soaking. The second possibility is that there is some sort of root damage which is preventing the plant from absorbing available water. If your plant is growing in sandy soil then Root knot nematodes could be the problem. The presence of Root knot nematodes often becomes apparent during periods of stress such as when the weather is very hot. They are quite common on the Perth coastal plain but can be difficult to treat. For further info visit http://archive.agric.wa.gov.au/OBJTWR/imported_assets/content/pw/gard/gn2004_023.pdf. Alternatively if your plant is growing in heavy soil has something occurred to cause waterlogging? This can cause root rot and subsequent wilting. Very heavy infestations of sap sucking insects can also cause wilting so inspect the plants to rule out insects such as aphids, scale or mites. Hopefully it is just a problem with watering because if it is nematodes or insects then there is a strong likelihood that the other trees will also be affected. 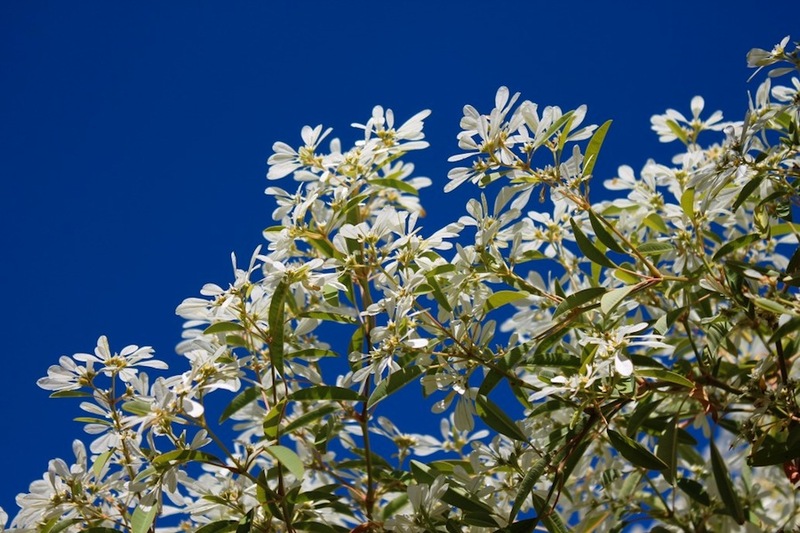 Yes your friend is correct – the Snowflake bush is green in summer and then it loses its leaves altogether for a short period. As the new leaves appear it starts to flower in autumn. Around each flower are the white bracts that look like leaves. The bracts are only present when the bush is flowering. In some climates it may be possible to prolong flowering time or encourage repeat flowering by lightly pruning then applying fertiliser but I just let nature take its normal course. I have a snowflake bush that I have had planted for a couple of years and it has never flowered. I’m so disappointed, is there a reason why it or my two new ones have never had a flower on them. Please give me some advice. Thanks Lisa. As mentioned in the article above Poinsettias (close relatives of the Snowflake bush) require about 12 hrs of darkness per day to initiate flowering. I suspect that it is the same for the Snowflake bush so check that there are no outdoor lights that may be coming on at night, particularly in autumn when the number of hours of darkness naturally increases. Without knowing the position and location of the plant I can only make general comments regarding other aspects. It needs to be in a warm, sunny position. Also apply slow release fertiliser with trace elements at the manufacturer’s recommended rate. In addition you could apply liquid fertiliser which is sold to promote flowers and fruit (or do as I did and apply worm juice). I have four snowflake bushes in my front garden in Port Pirie S.A. They have all flowered this year. Beautiful bush! Yes Bruce they are beautiful. You are a bit further south than I am but I think our weather conditions are fairly similar. My snowflake bush is flowering right now. We are getting a Snowflake from on of our neighbours for our dry tropical garden in Magnetic Island. Beautiful display of flower and a lovely smell of honey. The blue-banded bees love them as we do; anyone still trying to convince me that succulents are boring ? I guess aroma is in the nose of the beholder, Florian – but it is a delicious scent. I haven’t noticed many bees but will be on the lookout now. Hopefully you don’t have too much to worry about. In cooler climates the Snowflake is deciduous. As the temperature drops the plant reduces chlorophyll production so the leaves turn yellow. These leaves are susceptible to various infections resulting in spots and blemishes. A similar thing happens to rose bushes. I suggested you rake up any fallen leaves which may be harbouring disease spores etc and dispose of them. As long as the plant is situated as discussed in the article and has free air movement around it I think you will find that the new leaves produced when the weather warms up will be fine. I rescued two tiny seedlings from a footpath in Yamba nsw and planted them in my garden in Sydney. They have grown well and flower each year. I found a seedling under the trees and transplanted it in a pot and it is growing well. I now have seeds on my trees and plan to harvest and plant them. Are there any special instructions That I should follow? Congratulations on successfully transplanting the seedlings, Stephanie. I don’t have any experience in germinating Euphorbia seed but if I can’t find any information on seed that I wish to germinate I try lots of different methods. You could Google “Growing Poinsettia from seed” for suggestions of how to germinate a closely related species. Unfortunately, Snowflake bushes aren’t readily available in WA. I have contacted a number of growers and have been advised that they aren’t grown because they do not look very attractive(and therefore sale-able) in pots and also the toxic sap is a negative. (Toxic sap doesn’t seem to affect sales of Poinsettias). Also, Euphorbias can’t be imported from the eastern states or elsewhere. Beaufort Garden World have advised that they hope to source some locally produced seeds in the near future, so there may be some plants available next year. I have one of these plants and we need to uproot it due to renovation works , Its to big to move and im wondering how to propogate it , or maybe is it possible to cut back and then replace it somewhere else in the garden and also what time of year is best to do this ? I would definitely be tempted to prune it so that it is a manageable size and transplant it to a new position in the garden. The roots can also be pruned to make it more manageable. Prune it each year to maintain the desired size. The prunings can be used for cuttings.If the tree is exuding a white sap protect your eyes and wears gloves and wash the sap from the base of the cutting before it sets. Allow the cuttings to dry out for a couple of days before planting. They should be no thinner than a pencil and have at least 2 nodes – one to go into the ground and at one above from which the new leaves will emerge. From spring into summer is the best time to transplant and take cuttings or when you see new leaves about to shoot from the nodes on the dormant bush. If you have a warm sheltered position to put the cuttings you could take them now. 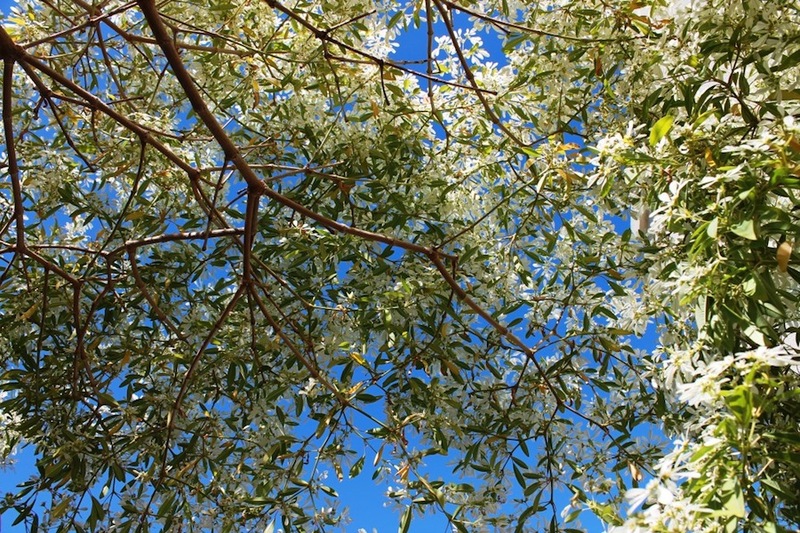 I bought our 6ft tree with beaitiful white flowers on it about a year ago. Thinking that it would bloom around this time again. However I don’t see any sign of the flowers. Is there anything else besides it not getting enough sun, why it wouldn’t bloom again around this time? Can I grow a snowflake bush from a cutting please? I live in Brisbane, Australia in what’s deemed a sub tropical environment I think. Thanks so much for writing the wonderful article with the clear explanations, pictures and the voice recording. It really helps with the pronunciation of the botanic name. Thank you Linda for the information on your page here about this beauty of a winter flowering bush…I was admiring the white flowers on a neighbours bush and got to talking to my elderly neighbour and she didnt know the name of the bush so I said I would try and find it (being a keen horticulturist thought it was my duty to help out) So I spent hours looking at Apocynaceae family plants due to the white milky sap…went to bed with nothing…started again the next morning and bingo found it was a Euphorbia. I cant wait to share the information with my neighbour – might get a cutting in spring for my efforts! Thanks Linda for your info on snowflake bushes. I live in Cairns in north Qld and I have had a large bush which has continued to spread babies throughout the garden. I find the bush will throw seeds after flowers die off. I guess the tropical climate helps them to sprout up easily, so much so that I have to pull them out like weeds. I have potted these saplings and transplanted them over the years and find they love being neglected and are currently in full bloom when other flowering plants are dormant. Happy gardening to all. You are very lucky, Mandy. All of us living in cooler climates are envious. I share your enthusiasm for identifying plants, Leanne. It is really rewarding to discover the identity of a mystery plant. Hi Linda, we have a beautiful snowflake tree at the front of our house, love it. We cut it back after it finishes flowering late July early August. Should we be cutting it back again before autumn? And also how far down should we cut? Am not sure how far back to cut mine. Have just moved into a new house which has these plants everywhere. They look very ugly and straggly trying to grow through the lemon trees and palms that are also everywhete. I live in sub tropical qld with sandy soil. You really only need to prune if you feel the plant is getting to large. You can cut back quite hard. If you wish to give it a second prune do so as the new leaves emerge. Look for strong healthy growth coming from a node and cut just above it. In general, refer to my comments to Julie. More specifically, your plants may be more straggly than usual because they are growing in too much shade. As you have numerous plants it might be best to selectively remove the ones which are growing through the lemon trees. You can safely reduce the height of the others by at least a third. Have a beautiful snowflake bush which has just about stopped flowering, will be pruning it back shortly. What is the best way of propagating cuttings? Have grown from the seed, and this year have a lot of seeds to try and grow. We are in Darwin so have approx 11 hrs daylight in the Dry and 13 in the Wet. It flowers well from June to Oct depending on the weather. Likes the cooler nights and dry sunny days.